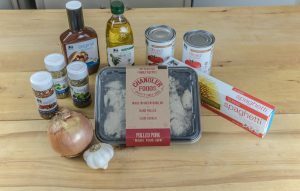 Pulled Pork BBQ Spaghetti with VIDEO – Chandler Foods Inc.
Heat oil, add onions and caramelize. Add garlic and cook till transparent. Combine herbs and cook with onions till aromatic then add tomatoes. Bring to a boil; add the BBQ sauce and pork simmer for 20 minutes. While sauce is cooking bring 1 gallon of water to a boil with 3 tbl of salt, add pasta and cook al dente. 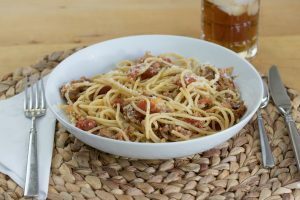 Drain pasta and toss with pork BBQ sauce, season and serve.